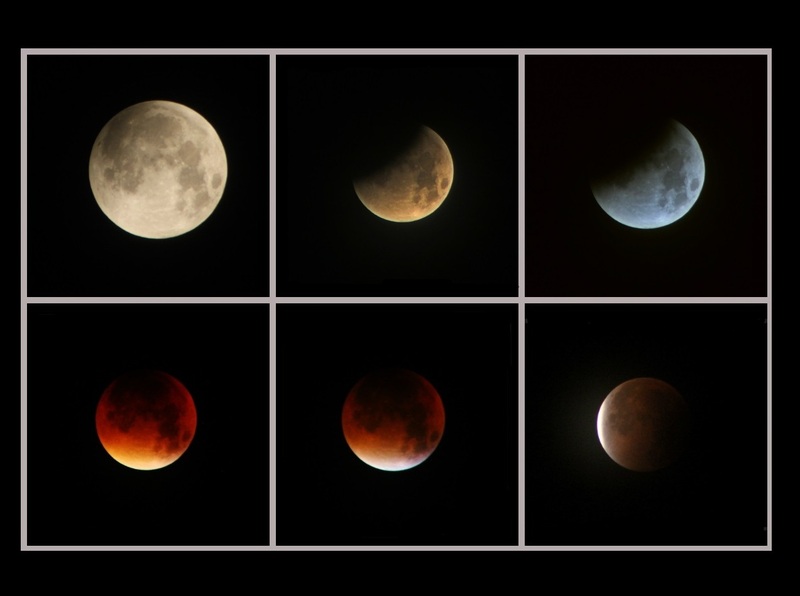 So… after all the build-up, all the “BloodMoon!” “SuperMoon!” “AbsolutelyDrenchedInGoreMoon!” hype, the much-anticipated total lunar eclipse of September 28th is behind us. And, surprise surprise, all the armageddonporn-loving “journalists”, raving nutter “pastors” and fruit loop YouTubers were wrong about it triggering earthquakes and nuclear war. (Even now, as you read this, they will be looking up the date of the NEXT eclipse and preparing to write absolute BS about that too). I hope you saw it, or at least part of it, from where you lived. Here in Kendal we had a surprisingly good view. I say “surprisingly”, because all the weather apps were predicting, before and all through the day, that we wouldn’t see it – or at least wouldn’t see much of it – because of cloud. Consequently, trusting soul that I am (I know, I used the words “weather apps” and “trust” in the same sentence, stop laughing) I spent several days agonising about what to do – whether to risk staying close to home and hoping to catch some of the eclipse through gaps in the cloud, or head somewhere else with a better forecast. At least one of my astronomical society friends, facing the same dilemma, took the decision to flee the county and headed south on search of clear skies. Thankfully she found a great spot and enjoyed lovely views of the eclipse. At the last minute I decided that it just wasn’t worth trying to get to clearer skies – in the limited time we had available we wouldn’t be able to get to anywhere with dramatically better prospects than Kendal’s. So, we rolled the dice and stayed home, deciding we would head up to Helsington Church, just outside Kendal, at midnight. When midnight came, the sky above Kendal was almost perfectly clear. All the weather apps were insisting I was under a cloudy sky, right then, but looking up from my phone I saw not a hint of a wisp of a cloud – just the brighter stars, and a huge, dazzlingly-bright Full Moon high in the south. It looked like we’d made the right call, so we headed out of town to Helsington, quietly optimistic about seeing the eclipse, by then just two hours from starting. – to find another problem. The car park was full of bullocks; great snuffling, snorting things were clattering about the car park tarmac on their hooves, heads swaying from side to side as they wandered around, in no obvious hurry to go anywhere. There was no way I was going to set up my expensive gear with those things blundering about, being all “curious” and “inquisitive”, so we waited until they had wandered off yo one of the nearby fields, hoping they wouldn’t come back again. At one point we were hemmed in by them, with one at each end of the van, watching us. It was like being in a bovine version of Jurassic Park, not fun at all. I mean, seriously, they should have been asleep at that time of night, surely? …and after that we had a great night – sorry, morning! Our view of the eclipse was uninterrupted by cloud (it got a bit hazy at the end, but we could still see and photograph the Moon) and we were joined by quite a few other people too. A policewoman, on her late night patrol, stopped to see what we were doing and ended up staying for an hour to enjoy the eclipse with us, and several of the people staying in the aforementioned bunk house came out to take a look too. It was especially good to be joined by Moira, another of our astronomical society members. 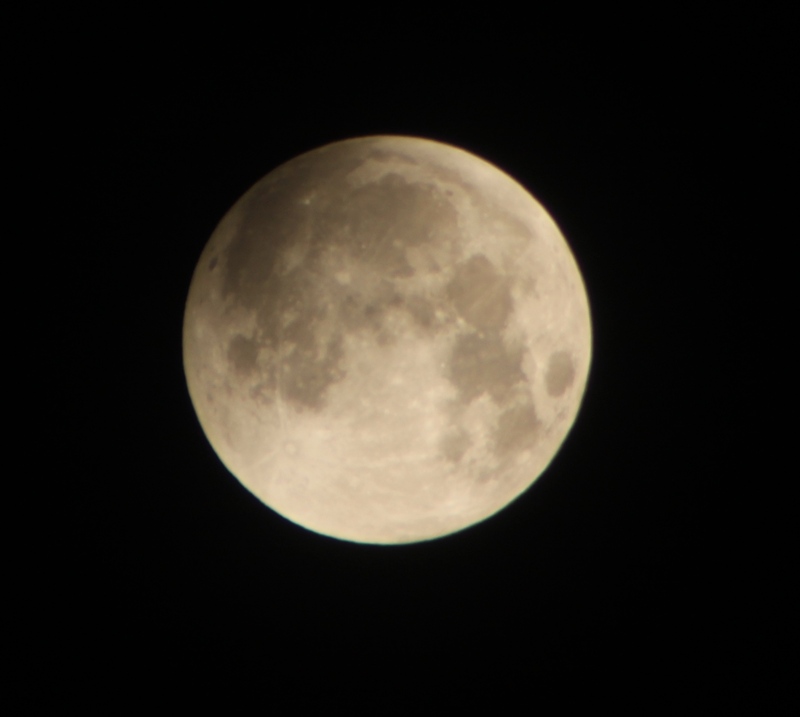 All in all it was a really good eclipse, both to watch and photograph. 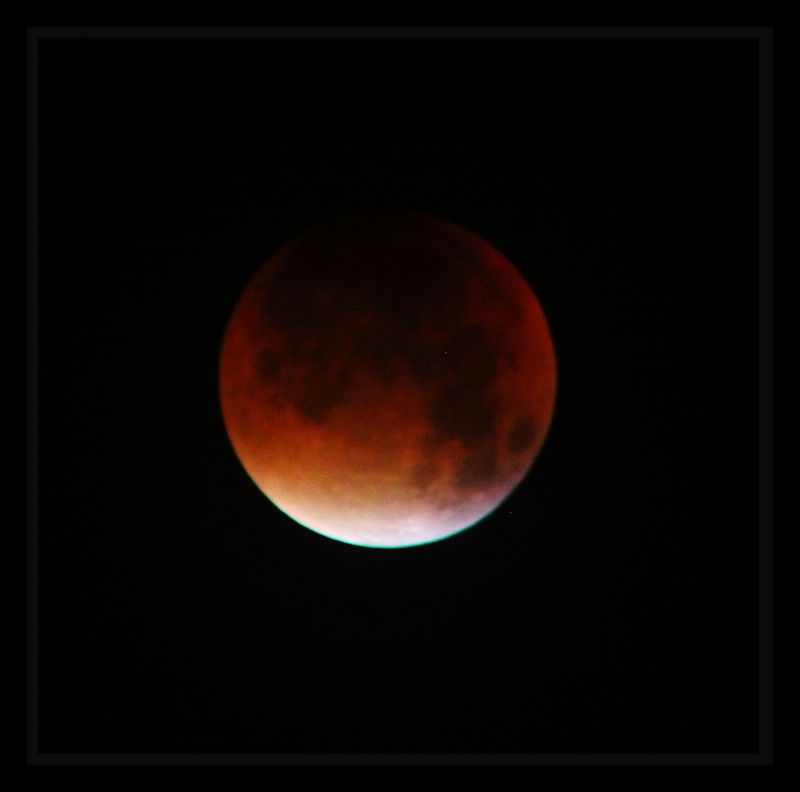 Ok, so it wasn’t as vivid or colourful as other total lunar eclipses I’ve seen – lots of people are commenting on how dark it was, and how that made it difficult to focus their cameras on it (use a bright star!!!!) 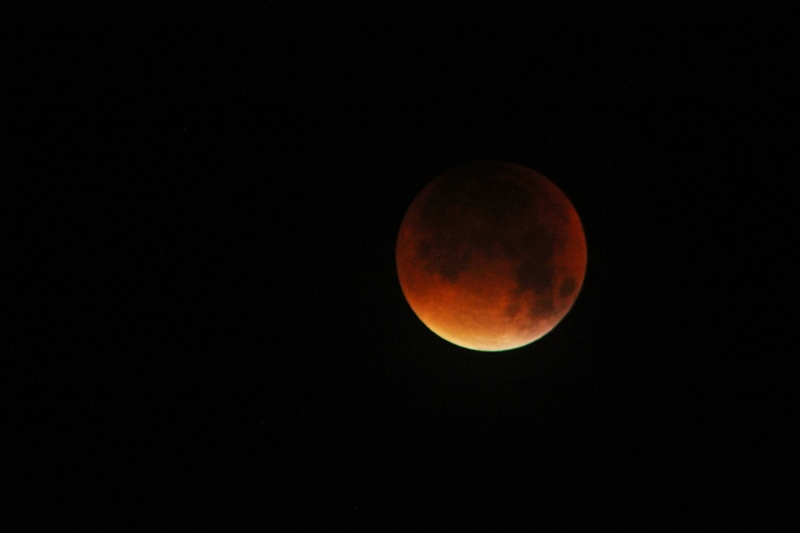 – but every eclipse has its own magic, its own unique qualities, and this one was no different. Although my camera has picked up the colours well, exaggerated them to be honest (as time exposures always do), through the telescope its hues were subtle and subdued – gentle pinks, hints of violet and blue. 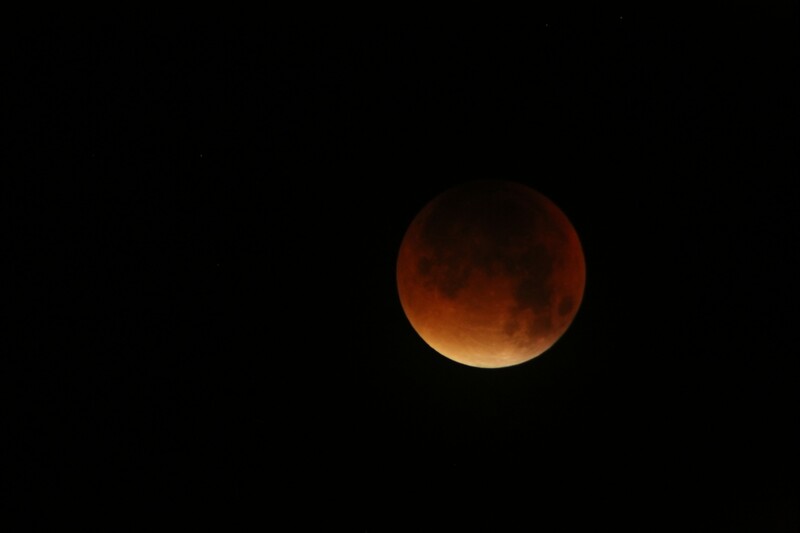 As totality proceeded I kept having to wipe the dew off my lens, but I didn’t care. I had started the day convinced that I would miss the whole thing if we didn’t get out of Cumbria, and even then we weren’t guaranteed to see it, but those dice we rolled came up with two sixes and we saw all we wanted to, from a good site, under a dark sky, with great company. ANd I got good photos (I think!) too! 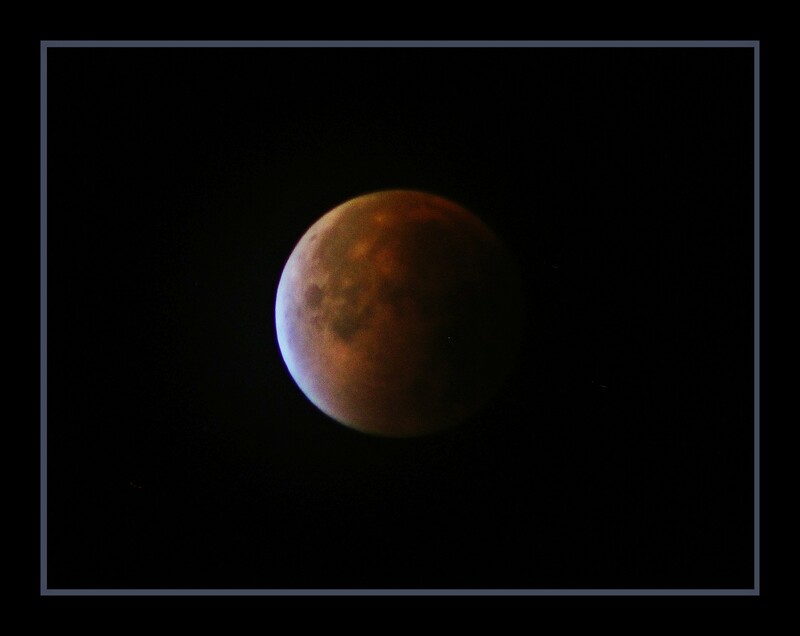 By half five the Moon had come out of the total phase of the eclipse and was brightening from the left, but by then it was starting to look fuzzy and blurry as it was covered by a veil of mist and haze, so we decided to pack up and head home. back in Kendal, as Venus blazed high in the brightening eastern sky, the bin collection wagons were trundling around, orange lights flashing, and the Moon was sinking behind the trees and houses, still looking very pretty but we’d had our fill and needed sleep. It had been a great night. A lot is being made in the media about how there won’t be another chance to see an eclipse like this until the year 2033, which is true; there won’t be another eclipse of a so-called “SuperMoon” until then. 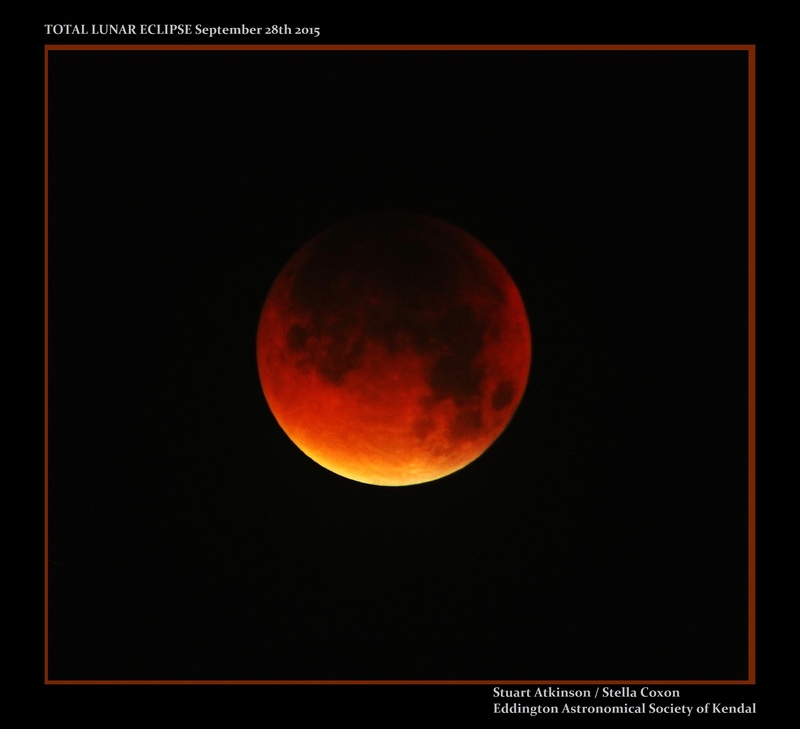 But if you didn’t catch this total lunar eclipse – or if you did, and are now hooked and want to see another – you won’t have to wait that long: the next total lunar eclipse visible from the UK will take place on July 27th 2018. 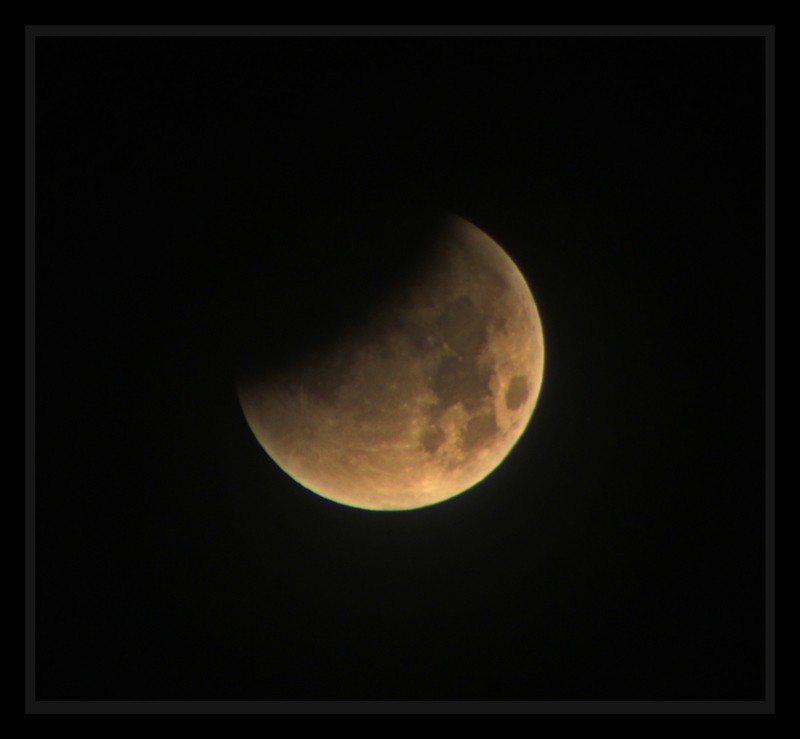 On that evening, at sunset, the Moon will rise already fully eclipses – imagine how many photos will be taken of that!! And as it rises we’ll see Mars close by, to its lower right, making for some great photo opportunities. 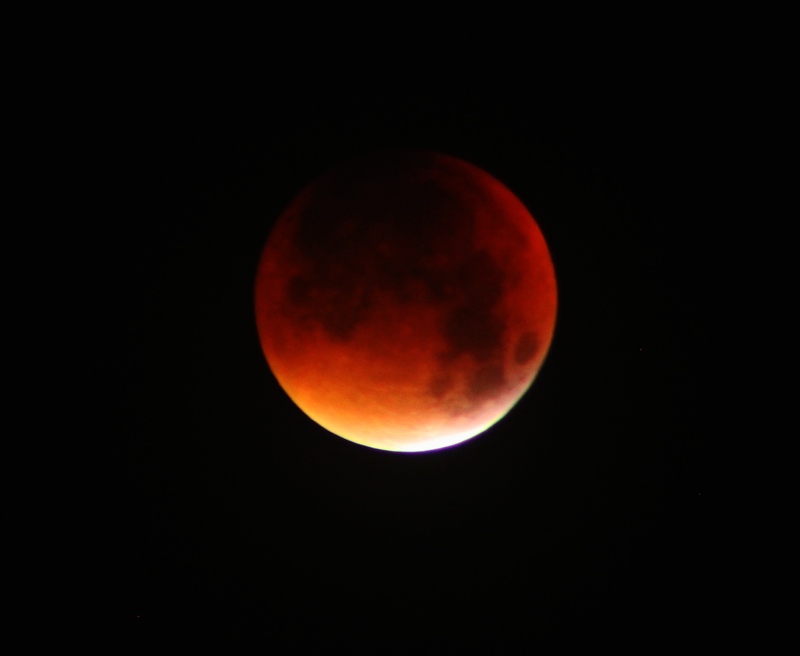 Less than a year later another total eclipse of the Moon will be visible from the UK, early on the morning of January 21st. So, put those dates in your diaries!